The race track may not leap to mind as the ideal venue for a family outing. Conjuring up images of unsavory characters smoking, boozing, and gambling, it’s not a place you automatically associate with family fun. 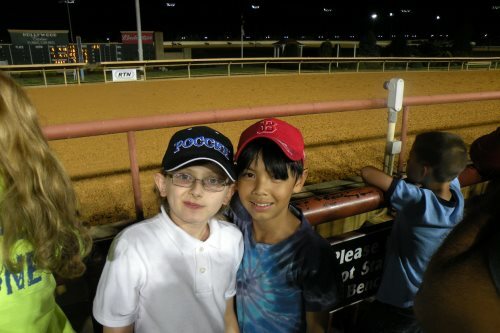 But for my horse-crazy kid with aspirations of becoming a jockey, the track was the perfect place to celebrate his tween birthdays. Our local track also makes for a great way to spend a fun and affordable day—and your track may, too. 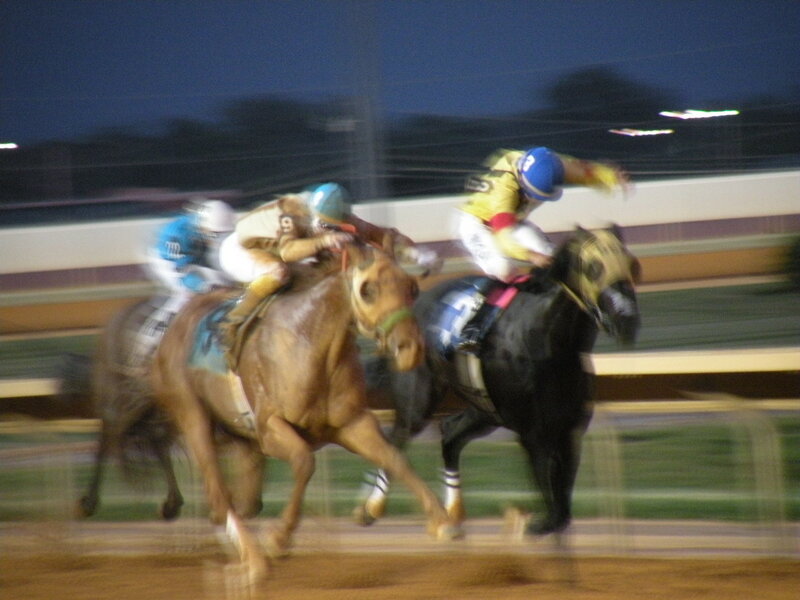 A mere hour from Washington, D.C. in scenic West Virginia (and near Harper’s Ferry), Charles Town Races can turn even a non-horse lover into a racing enthusiast. 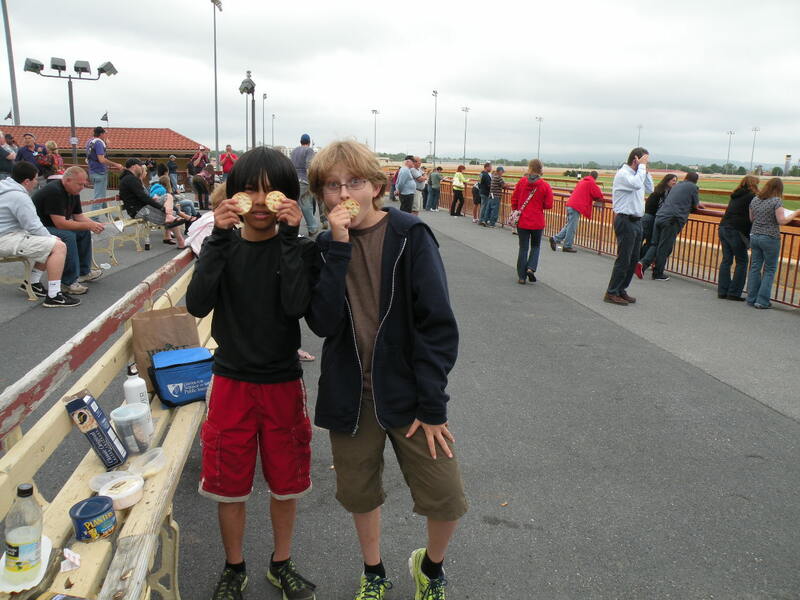 Let Kids Bet at the Race Track … Sort of. Give the kids a small sum to blow on bets (adult-placed, of course, as is legally required, with a $2 minimum). We gave our boy and his friend $20 each. One kid lost it all, the other came out $4 ahead. Kids can check out the horses in the paddock pre-race and study the racing forms, which has the added bonus of letting them apply principles of probabilities to the real world. The forms provide critical information about wagers and key facts about the riders and horses. (Unfortunately, they won’t tell you the origin of any of the horses’ enigmatic names–Icy and Civil, Cat Nip Kitty, Bubba de France, Blame it on Bush, and Follow the Whales, for example). Bet or no, standing at the rail and watching the horses saunter to the starting gate, charge out, and thunder across the finish line is great entertainment. For best viewing (especially for shorter spectators), be sure to secure a position at the rail five or 10 minutes before post time. Each race begins with an attention-grabbing bell followed by the announcer’s cry over the loudspeaker of “and they’re off!” Jumbotrons in the center of the track serve to capture the action on the far side (just in case you thought the track would be a screen-time break), and the postings of winners and winnings on the scoreboard allow for post-mortem discussions of odds and payoffs; you’ll learn all about trifectas and exactas. After each race, the kids can get an even better look at the jockeys and their favorite mounts during the modest ceremony in the winner’s circle right near the rail. If the kids are lucky, the jockey might hand them a pair of souvenir goggles. You can find out about the family friendliness of your local track by calling and asking about their kid policies, schedules, and atmosphere. One employee at another local track I called (Pimlico) said kids were welcome but the track was packed and the crowd hard-drinking and boisterous. Photos on the web of a crowded in-field and bleachers confirmed my instinct to head to Charles Town. If you do find a track like Charles Town, it’s hard to beat the sight of gorgeous steeds kicking up dirt and the thrill of the race. Other than the cost of a racing program ($2.50), your losses, and snacks, the excursion shouldn’t cost much. Erica Rosenberg is an environmental consultant and writer in Washington, D.C. She’s also the mother of 12-year old boy, whom, at times against his will, she takes on countless excursions. Since writing for a travel guide after college, she has loved to explore and is an obsessive trip planner.